University of Bath Press and Media Officer Andy Dunne has won the Medical Journalists' Association inaugural Award for Excellence in PR. 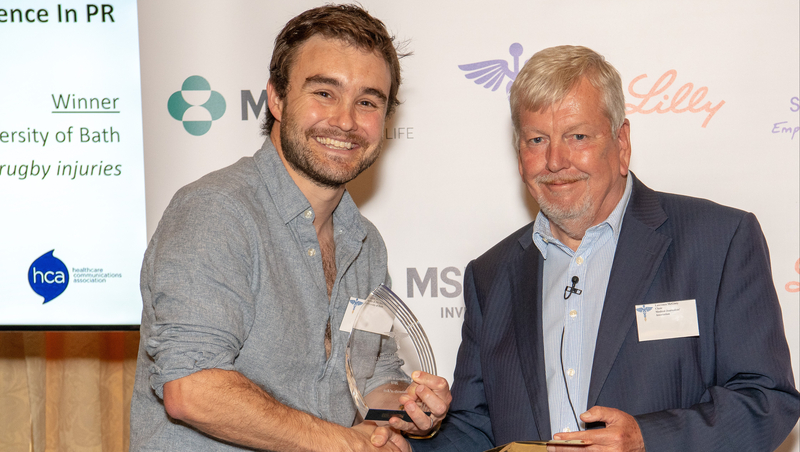 Andy was given the award last week at a ceremony in London for his work in promoting research from the Department for Health and England Rugby last spring, which was led by Professor Keith Stokes. The benchmark study, published in the British Journal of Sports Medicine, drew on findings from the School Injury Prevention Study (also led by the Department for Health and the Rugby Football Union from 2013 – 16) to show the dramatic effect of a newly-devised exercise programme for reducing overall injuries for youth rugby. It found that through the 20-minute Activate exercise programme, to be performed by players before matches and in training, overall injuries fell by 72% and concussion injuries dropped by 59%. The Activate programme has since been rolled out nationwide by England Rugby. The PR to support this new study coming out led to 242 individual items of news coverage in one day. This included 170 broadcast through the BBC – Radio 4, 5Live, World Service, Radio 1, BBC Asian Network. This included a live feature for BBC Breakfast, filmed locally at Monkton School. The story was also featured by Sky News, ITV, Talk Sport, The Times and Guardian, as well as extensive regional outlets. Combined this media coverage helped to reach an estimated audience of over 30 million people. The MJA award for the University complements the Communications team picking up last year’s CIPR PRide Award as ‘Public Sector Team of the Year’. Corinne Evans, Head of Communications, said: "We are so proud of Andy for winning this inaugural MJA Award for Excellence in PR for the University, particularly with such stiff competition from big-budget PR agencies. He thoroughly deserves the recognition. It comes only a few months after we won the Chartered Institute of Public Relations (CIPR) PRide award, “Public Sector Team of the Year” for the South of England.